William Thomas Taylor Sr. was my paternal grandmother's second husband, my father's step-father. 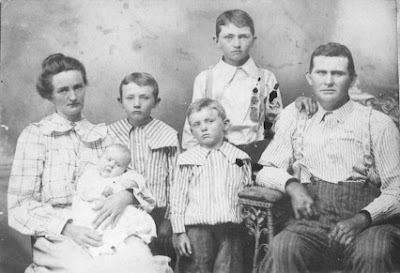 He is shown in the following photo in about 1912 with his first wife Georgia [1878-1918] and their children. Georgia died just a couple weeks shy of her 40th birthday. She looks older than 40 in this photo, doesn't she? Life was hard. I have a photo or two of William Taylor in later life and I did notice his hands looked damaged. I can see from this earlier photo that his hands had been hurt or damaged for some time. He certainly had a rough life. The whole family looks pretty unhappy here, and that's very sad. Maybe they were just having a rough day, as any mom of a large family will tell you, it's not easy by any means to get kids to stay clean for even 5 minutes and in those days those clothes were washed by hand. I'm sure the kids were fidgety and didn't want to stand for the photo either. I'm tired just thinking about what their day was like. William Thomas Taylor was born July 15, 1870 in Alabama. he died on the 16th of May in 1951 at age 80 years and 10 months. His father was named Richard Thomas Taylor [1845-1932] and was also from Alabama. His mother's name was Elizabeth Lucy Suggs Taylor [1850-1927]. From many accounts I've heard from good sources that William T. was not the nicest man in the world by any means. And he's not in my family line, so why would I write about him and put his picture here? Well he was not my father's birth father, but he was the father my father knew. So, good or bad, he had a part in making my father the man he was. We also don't know his story. What's the deal with his hands? Clearly he had a rough life, and we need to know his entire story and try not to judge.